—Jessica Alba, along with her mother and father (who served in the military) met with the Honest Company customers and service members at the Navy Exchange at Pearl Harbor in Honolulu. —Sarah Michelle Gellar educated Santa’s Secret Workshop attendees on her organic/non-GMO baking-goods company, Foodstirs, while handing out goodies at the Andaz hotel in West Hollywood. —Conan O’Brien served as the MC at the Children’s Defense Fund’s Beat the Odds Awards at the Regent Beverly Wilshire in Beverly Hills. —Anne Hathaway, Helena Bonham Carter, Sandra Bullock and Cate Blanchett filmed the upcoming Ocean&apos;s Eight at Altamarea Group&apos;s Vaucluse in NYC. —Catherine Giudici completed the bulk of her holiday shopping using Thoughtfully.com to gift loved ones with personal and unique items catered to their personalities, and all from the comfort of her Dallas home. —Becca Tilley celebrated the launch of her blog and YouTube channel with help from fellow Bachelor alums JoJo Fletcher, Luke Pell, Chris Soules and others at the Bachelor Mansion in Agoura Hills, California. —Olivia Culpo toasted with Perrier-Jouët Belle Epoque in celebration of the opening of Ora in Miami during Art Basel. —Joan Smalls rocked the Agnes cowl-neck cami by Line & Dot on while walking around Paris. —A$AP Rocky snapped a selfie with Russell Simmons at the Bombay Sapphire Artisan Series finale party during Art Basel in Miami’s South Beach. —Jhené Aiko performed at the Moschino Takes Miami Art Basel party at the Delano Hotel in Miami’s South Beach neighborhood. —Paris Hilton blew kisses to the crowd while deejaying during Galore Magazine’s art issue at the W Hotel’s Wall Lounge in Miami. —Redfoo of LMFAO performed at Sapphire 39’s holiday party in NYC. —Lily Collins gave major Disney princess vibes as she attended the Kirk Douglas Award for Excellence in Film honoring Warren Beatty at the Santa Barbara International Film Festival, presented by Hennessy Paradis Imperial. —Ben McKenzie promoted Fox’s hit show Gotham at the Empire State Building in NYC. —Mark Ruffalo spoke about his activism and involvement in Standing Rock at the 20th Century Women premiere in NYC. —Jamie Chung helped launch the 2017 Looking Further with Ford trend report with Ford’s in-house futurist, Sheryl Connelly, at an intimate dinner in NYC. —Katie Holmes told Us about making her directorial debut at the All We Had Cinema Society & Ruffino screening in NYC. —Sara Sampaio wore the Eve Sweater by dRA while out and about in Paris. —Sabrina Carpenter stopped by Google’s Made With Code activation at the Jingle Ball Village Pre-Show in L.A.
—Kid Cudi hosted Beats Presents … the Clubhouse Dance Party at the Factory at Magic City Studios in Miami. —Emmy Rossum, wearing David Webb earrings, chatted with Glenda Bailey and Steve Swartz during the Lincoln Center Corporate Fund black-tie gala honoring Carolina Herrera at Alice Tully Hall in NYC’s Lincoln Center. —Virgil Abloh spun for the crowd at the Future Archives Party benefiting Skate Free at Lot 11 skate park in Miami. —Jourdan Dunn danced with friends at the American Express Platinum Collective&apos;s afterparty at the Faena penthouse in Miami. —Nas performed his hits for the crowd at 1 Oak in Miami for Art Basel. 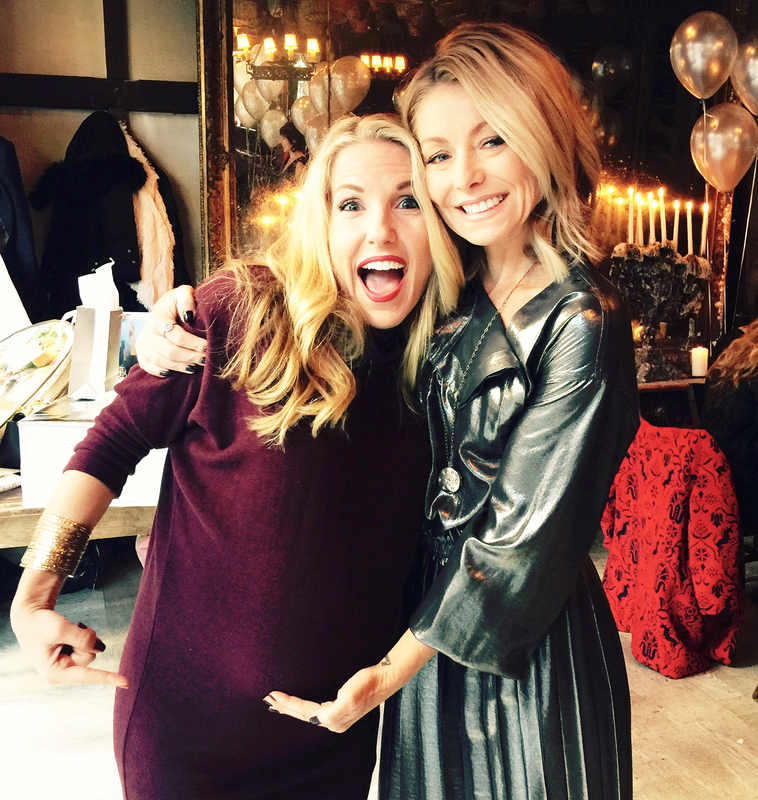 —Kelly Ripa hosted a baby shower for longtime trainer Anna Kaiser at NYC’s Gemma. —Andreja Pejić chatted with guests during VLONE&apos;s private dinner celebrating the Nike AF1 VLONE collaborative sneaker at Komodo in Miami. —Morrison Hotel Gallery co-owner and photographer Timothy White entertained at the Long May You Run Neil Young retrospective exhibit opening, featuring images from photographers such as Julie Gardner and Danny Clinch, at Morrison Hotel Gallery at the Sunset Marquis Hotel in West Hollywood. —CEO Paul Kim of Image Locations threw a holiday ball and toy drive to benefit Catarina’s Club at the agency’s Sky Studio in Downtown L.A.
—Millie Bobby Brown bought holiday presents for her Stranger Things castmates at the UGG store at Disney Springs in Orlando. —Meghan Trainor wore a Milly Leather Jacket while announcing the 2017 Grammy nominations in NYC. —Marc Anthony performed at Foxwoods Resort Casino in Mashantucket, Connecticut. —Peyton List wore David Yurman jewelry in NYC. —Rae Sremmurd and Gucci Mane performed at YesJulz 1AM Vibes Powered by Vevo, where guests were treated to an exhibit of the evolution of Puma, with never-before-seen images from Sickamore and Mark Anthony Green, in Miami. —Antoine Verglas exhibited "Beauty and the Beach" with photos of Diane Kruger and Angelina Jolie at Elements pop-up, which previewed new items from PrismSport, Eric Javits, Michi, Encircle.nyc, Same Sky and fitness classes from Elements Fitness curated by PopUpSummer at the new Salotto salon at 1 Hotel in Miami. —Dolores Catania and figure skater Sasha Cohen celebrated the birthdays of Tom Murro and Alicia Quarles at Troy Liquor Bar in NYC.